…to First Responder Radio Communications. 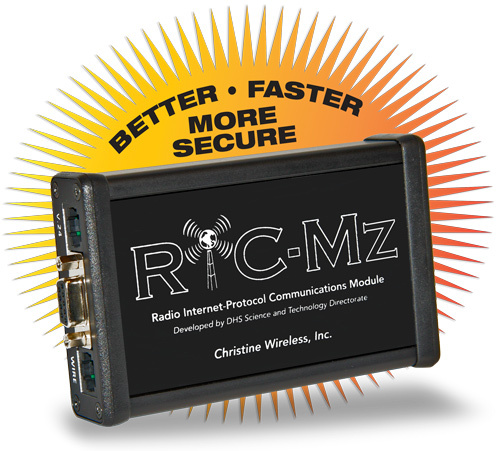 The RIC-M is an external after-market protocol converter allowing Conventional Motorola ASTRO™ base stations and other related equipment to be interconnected using Internet Protocol. The new RIC-Mz features TLS 1.2 key exchange encryption advanced security and is designed to the DHS 4300 policy standards for the protection of sensitive information. Designed for use in State, Local and Federal First Responder, Public Safety and Law Enforcement radio systems. Developed by Christine Wireless, Inc. under contract to and licensed by the Department of Homeland Security Science and Technology Directorate. • Elimination of expensive and hard to get copper telephone circuits to interconnect Conventional Motorola ASTRO™ system elements. • Interconnects via Internet, private intranet, satellite, cellular and Virtual Private Networks. The RIC-M utilizes Project 25/APCO/TIA published and draft standards. Bringing IP Interconnectivity to First Responder Radio Communications.